February 2019: Two Future City teams from the Decorah Middle School presented their projects, a redesign of the future cities Cienfuegos, Cuba and Terremoto, Chile. January 2019: Eric Holthaus, the Sustainability Coordinator for the City of Cedar Rapids, shared initiatives including increasing pollinator-friendly spaces, becoming a STAR certified city, and starting sustainability initiatives at a city level. December 2018: Steve Falck from the Environmental Law and Policy Center informed us about the current state of clean energy policy at the state level. November 2018: Brian Krambeer, President and CEO of MiEnergy REC, shared about the company’s pilot battery storage program. October 2018: Nine northeast Iowa cities and counties are partnering with the Energy Districts of northeast Iowa to evaluate the potential to achieve the SolSmart designation. SolSmart is a national program that certifies local governments as solar friendly, or “open for solar business”. August 2018: Sustainable Schools AmeriCorps program manager Carmen Finken shared the successes of the newest Green Iowa AmeriCorps program’s pilot year. July 2018: The Energy District proudly unveils Agreport, a 2 year project that has culminated in a web agriculture energy tool. Featured speakers included web developer Brad Crawford and Todd Duncan of NRCS. Read about it here. June 2018: View part of Reinventing Power: America’s Renewable Energy Boom, a documentary produced by the Sierra Club’s Beyond Coal Campaign. May 2018: Craig Mosher, resident and co-founder of Prairie Hills Cohousing in Iowa City, shares the startup process and green building considerations for the new sustainable living development. See presentation slides: Iowa City Cohousing. April 2018: The effort to form a municipal electric utility, Decorah Power, answers questions about the impact of a municipal electric utility in Decorah, the decision-making process, how to vote, and how it could affect our community. March 2018: The professionals at KAR Auto Group, the region’s first certified Volt, and Bolt dealer, shared their electric vehicle offerings, how EVs differ from combustion engines, and where they see electric vehicles going (so to speak). February 2018: David Wadsworth of Wadsworth Construction talked on the topic of windows, window restoration, and how this important facet of your home intersects with the home’s overall energy efficiency. To see a PDF of the slideshow, click here. January 2018: Decorah Power and New Gen Consulting presented the feasibility study results for Decorah Power’s municipal electric utility potential. View a video of it on our facebook page. Click here to see the full feasibility study report. December 2017: Energy District staff briefly highlighted key district initiatives from 2017, including a partnership with Decorah Power, Farm Energy Planning, Green Iowa Americorps, and the expansion of Energy Districts in NEIA, followed by an update of energy policy issues at the local, state, and federal levels. 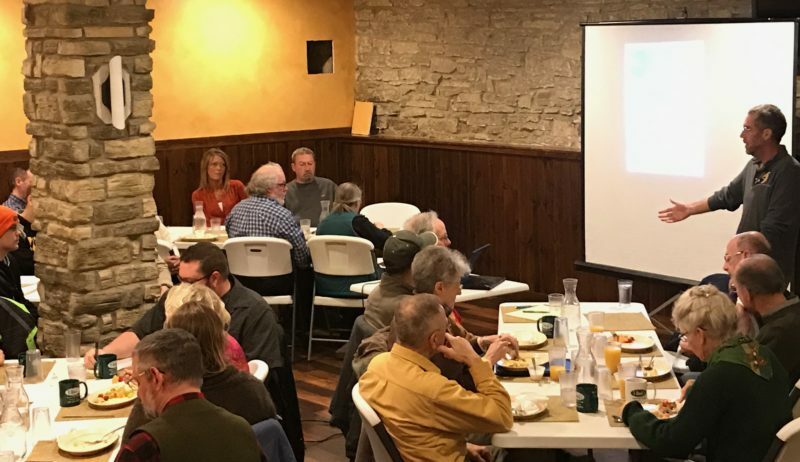 October/November 2017: Energy Breakfasts were skipped to encourage attendance at Decorah Power Learning Series events. September 2017: David Osterberg, founder of the Iowa Policy Project and Iowa state representative, gave insight in into the current Alliant rate increase. Osterberg offered insight into rate increases in the broader context of investor-owned versus consumer-owned utilities. See Decorah Power’s video of a conversation had with Osterberg about this topic. August 2017: Luther College Professor Jim Martin-Schramm spoke about the policy and practice of clean energy transition and differing approaches to nuclear and hydraulic fracturing in Germany and the UK. Jim and Karen Martin-Schramm led Luther’s Nottingham program in 2016-17. July 2017: Waverly Utility’s CEO/General Manager Darrel Wenzel spoke about the successes and challenges of a municipal utility in a town of 10,000 people. June 2017: Clayton County Energy District President Harry Blobaum and Coordinator Joleen Jansen shared how they’ve gone about organizing to keep energy, dollars, and jobs local during their first year of existence. Video excerpt on YouTube. May 2017: General manager Josh Byrnes of Osage Municipal Utilities, a small but mighty municipal electric utility that provides gas, electric, and telecom to the community of Osage, Iowa addressed the benefits and challenges of running a small municipal utility. View on Youtube: Part1, Part 2, Part 3. April 2017: Winneshiek County Conservation’s Lilly Jensen and Luther College professor Dawn Reding shared information regarding varying effects of energy production on wildlife. Reding shared the single-turbine bat research conducted at Luther College. March 2017: Allamakee-Clayton REC Executive Vice President/General Manager Paul Foxwell talked about electric rate-making principles and upcoming projects. February 2017: Manager of the New Hampton’s Municipal Electric Utility Brian Quirk will talkws about the challenges and opportunities of a municipal electric utility, with a focus on the local economic impacts of keeping energy dollars local. January 2017: Andy Johnson and Larry Grimstad spoke on critical issues for solar owners: state tax credits, net metering, and the Winneshiek Shared Solar project. December 2016: Sam Pollan shared his experience attending this year’s United Nations Framework Convention on Climate Change held in Marrakech, Morocco. October 2016: Gary Mineart shares about satelite technology’s role in climate science. September 2016: Our annual policy breakfast, featuring a candidate forum on energy policy with State Senator Michael Breitbach, State Senate Candidate Jan Heikes, and State Representative Candidate Micheal Bergan. August 2016: Revisiting Decorah’s first community-wide sustainability plan from 2010, including eergy accomplishments … and opportunities! June 2016: Hawkeye Rural Electric Cooperative CEO Brian Krambeer updated the group on their merger with TriCounty REC, discussed distributed generation and related issues, and took questions. May 2016: We discussed the current proposals Alliant Energy and MidAmerican Energy have presented to the Iowa Utilities Board to replace net metering, what they mean for current and future solar owners, and what we can do about it. April 2016: Local panel discussion on Electric Vehicle Public Charging Infrastructure plans, and other aspects of the electric vehicle opportunities. March 2016: Iowa Environmental Council’s Nathaniel Baer, Luther College’s Jim Martin-Schramm, and the Energy District’s Andy Johnson will discussed current Iowa energy and solar policy challenges and opportunities. September 2015: State Senator Michael Breitbach joined us to discuss energy efficiency, renewable energy, and the coming legislative session.